Incorporated into your bedroom decor, our Amish Versailles Low Dresser will serve as an elegant storage piece that will accentuate your entire decor! Featuring six large, fully extending drawers and two hidden, felt lined jewelry drawers, you'll have ample room to store your clothes and important items right where you need them! Include the beautiful, matching beveled edge mirror, so you can be sure that you look your best when you go out to face the day! 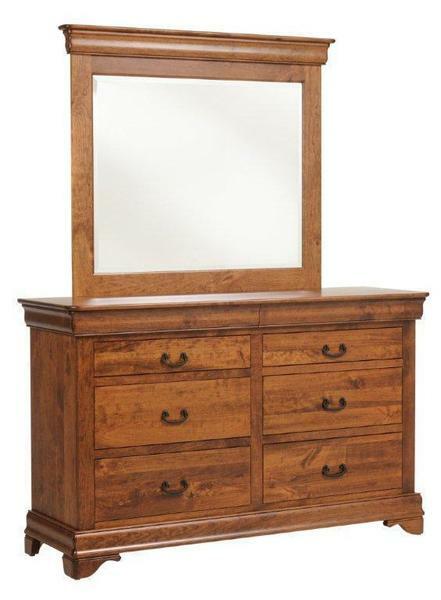 Each piece from our Versailles Amish Bedroom Collection is handcrafted from solid hardwood and finished to perfection. Your new unique bedroom decor will be bench-built, using old world techniques that ensure an heirloom quality finish that will last generations! Call one of our experienced Amish Furniture Specialists today with any questions you may have. We can provide stain samples, so you can be sure your new pieces will perfectly match your existing decor!